Renew your items to gain better exposure for your shop listings and better positioning in search results and category pages on Etsy. Below is a step-by-step guide for automatic the renewals. You can view a more detailed description of all the options here. Renew specific items, the oldest item, random items, expired items or items based on keywords. 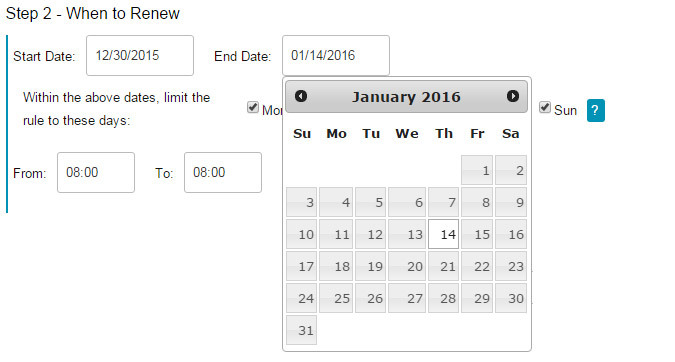 Choose the time window and the dates you want the rule to be active. Choose how often items are renewed in minutes, hours or days. View the number of scheduled renewals and the resulting charges by Etsy before scheduling the rule. Click this button to activate the rule. Please note that if step 1, 2 or 3 are incomplete, the button is disabled. Once a rule is set, you can edit, copy, disable or delete it. When you renew a listing, your item is treated as 'newly listed'. Consequently, your item visibility is improved and it can be found more easily when someone is searching for an item like yours. Renewing items also brings them to the top of your category which can help with your Etsy store exposure.